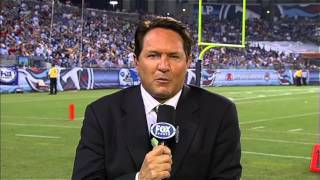 Chris Myers has interviewed most of sports' biggest stars. The list of compelling people that Myers has interviewed includes these notable figures: Muhammad Ali, Mike Tyson, Jack Nicholas, Tiger Woods, Joe Montana, Tom Brady, Barry Bonds, Roger Clemmons, Pete Sampras, John McEnroe, Magic Johnson, Wilt Chamberlain, Billy Jean King, Danica Patrick, Phil Jackson, John Wooden, Bill Murray, Tom Hanks, Billy Crystal, and numerous others from the world of sports and entertainment. Charlie Weiss, Notre Dame Head Coach - He told me his dream was not to play football, but to broadcast. He enjoyed Mel Allen and Marv Albert. Kobe Bryant, Los Angeles Lakers Superstar - He told me that he will be measured by championships, not scoring titles or MVP awards. On his recent change from jersey #8 to #24, Kobe said it's to signify a new chapter in his life. Jose Canseco, former Major League Slugger - He told me there was no question in mind that Barry Bonds used steroids. But when I asked him about Roger Clemmons, he was not sure if he used steroids. He would only comment if he was assure of it. Chris Myers interviews Bill Murray on Fox Sports 1 on 1. 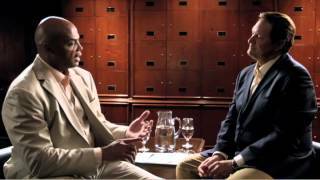 Chris Myers interviews Charles Barkley on Fox Sports 1 on 1.